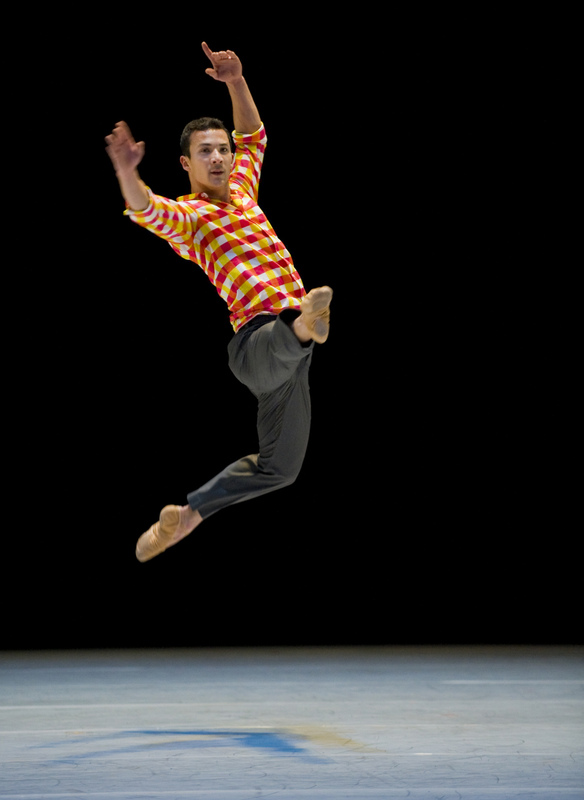 William Forsythe’s “StepText” and the Lyon Opera Ballet at the Joyce Theater…. Lyon Opera Ballet is not a traditional ballet company for missing from the company’s repertoire are the great White Ballets such as Swan Lake or Giselle. Instead this exceptional company it is committed to showcasing the work of significant contemporary choreographers by superbly trained and gift dancers. 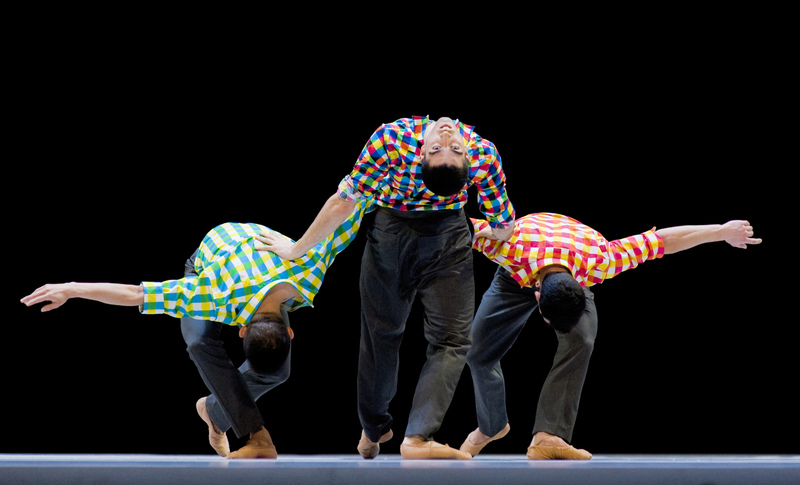 The Lyon Opera Ballet’s program at the Joyce Theater, April 19-May 3, 2015 presented three works and all created within the last thirty years, Benjamin Millepied’s Sarabande (premiering in 2009), William Forsythe’s StepText (premiering in 1985) and the New York premiere of the Israeli-born, French-based choreographer Emanuel Gat’s Sunshine from 2014. 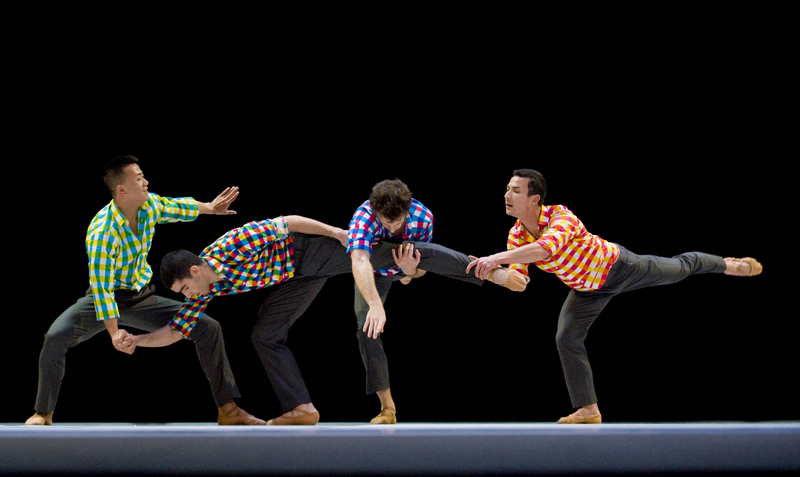 Benjamin Millepied’s Sarabande is a work for four male dancers wearing casual street attire. Paul Cox had the men in tan pants with each dancer wearing a plaid shirt but each shirt in a same but yet slightly altered color scheme. Julian Nicosia began the piece by dancing solo to two extracts from Bach’s Partitas for Solo Flute while being accompanied on stage by flutist Stefan Ragnar Hoskuldsson. Mr. Nicosia is a most gifted dancer; he possesses a natural lyricism mixed with a wonderful sense of athleticism. Mr. Millepied’s chorography is attentive to the music for it flows intrinsically from shape to phrase. There is a freedom to the work making it seemed improvised, of the moment. Quick transitions of weight are followed by rapid changes of direction and focus with astounding leaps and jumps. It is a delicious work that allows you, the viewer, to sit back and enjoy the beautiful simplicity of the piece. Emanuel Gat’s Sunshine, for me and a few others in the audience (I know because I asked) was a bit of a head scratcher. After the serenity of Sarabande, Sunshine seemed chaotic with dancers running, jumping, sliding in various directions, sometimes to music, sometimes not. The score, which did not help the choreography in the least, is a recording of rehearsals of Handel’s Water Music. Mr. Gat did not incorporate the music in either the creation of the work or the rehearsal process but added it just days before the premiere. Sadly this showed…. The pièce de résistance for the evening was William Forsythe’s 1985 work Steptext. It is quartet for three males and one female dancer to Bach’s Chaconne for the Partita No. 2 for Solo Violin in D Minor. Mr. Forsythe once famously said “The [classical] vocabulary is not and will never be old; it is the writing that can be dated.” So it is that with StepText he applies the classical vocabulary in ways that he is known for by the altering phrasing with unexpected combination of steps and body positioning. Two men, in all black with their arms uncovered begin to move in almost darkness. It is the play of shadow and light of the dancers’ bare arms that draws your eye and first brings them to your notice. They leave the stage as we hear a violin, but only briefly. Dorothée Delabie, wearing a red sleeveless body suit, walks on stage. She too starts to move just her arms in silence. Again the violins are heard but only for an instant. A man walks up behinds and so begins the dance. Steptext was choreographed in 1985 just two years before Mr. Forsythe’s groundbreaking work In the Middle Somewhat Elevated. You can see the same use of extended limbs with balance off kilter. Ms. Delabie was tossed and turned then tossed and turned again. Her every move was magical. If you have not seen William Forsythe’s StepText or the Lyon Opera Ballet in performance you are doing yourself a grave injustice. « ZviDance presents the World Premiere of Escher/Bacon/Rothko / New York Live Arts June 24 – 27, 2015…..